Happy 2009 and congrats to all of you who just got engaged! It was eight years ago tonight that Darin proposed. Wow. Enjoy the journey – it all goes by so fast! Seems everyone is touting the benefits of small weddings these days. Not long ago Cosmo ran an article called Why Small Weddings Rock. “Designer dress. Jaw-dropping location. Stunning flowers. Amazing band. Yep, even on a modest budget, a Hollywood-style wedding is possible when you keep the numbers down. The less you have to spend feeding throngs of people, the more you can splurge on the things that matter to you,” writes Cosmo. Why is the mainstream media catching on to this trend? The “R” word. The economy has really added fuel to an already growing trend. Couples realize cutting the guest list means that they can still have a great wedding without going over budget. In 2009 the trend will grow even bigger. 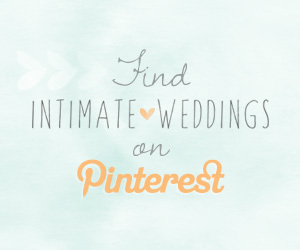 As you browse the wedding venues at IntimateWeddings.com, you’ll notice that many of the venues are inns and bed and breakfasts. Inns and bed and breakfasts are ideal small wedding venues. Whether you want a small decadent indoor wedding or a simple garden wedding on a budget, there’s sure to be an inn or bed and breakfast to suit your needs. Although many couples choose inns that they have previously stayed at to get married, some couples choose small wedding venues they’ve never visited. It might be an inn just a few blocks away, or one on the other side of the country – or even the globe. If an inn piques your interest, there are things you need to discuss with the innkeeper before choosing it as the venue to have your wedding. How many guests can the Inn accommodate? Do you have all inclusive package deals? Where is the ceremony held? Is it indoors or outdoors? If the ceremony is outside, is there room inside in case of inclement weather? If not, will a tent be provided? Where is the reception held? If the reception is outdoors, is a tent provided? Is there a wedding coordinator on site the day of the wedding? What about a florist? A photographer? Is there an onsite caterer? Who performs the wedding ceremony? Do we need to hire our own minister? Is alcohol permitted? Can we bring our own? Can we bring our own cake or other food items? What type of reception meal is available? Is it buffet or plated? Can I have a brunch reception? What about a cocktail reception? What about a seated dinner? Do you allow music? Can I hire a deejay or a band? Can we rent out the entire inn? Do you have a changing room for the bride and bridesmaids to get ready in? What about a changing area for the groom and his attendants? If not, will we have to rent a room in the inn for this purpose? Can we save money by getting married off season? Do we have to stay overnight at the inn to get married there? How much time is allotted for our wedding if we are only renting the space for the day? Is there a group discount available to my guests if they stay overnight? Is there ample parking for wedding guests? If you love quaint fishing villages and rocky seascapes, why not tie the knot on the East Coast of Canada? There are plenty of venues that are perfect for East Coast weddings. Whether you’re an Anne of Green Gables die hard or not, you can’t help but fall in love with both Cavendish and Rustico Bay, in the heart of Ann’s country on the northern shore of PEI. Located near Prince Edward Island National Park – with its sandy beaches, cliffs, dunes, marshes and forestlands, Rustico is a utopia for nature lovers. Just imagine taking a pre-wedding stroll along one of the quiet clay roads, before saying “I do” at an inn overlooking the glittering sea. Sounds lovely, doesn’t it? Barachois Inn – This 15 room inn was built in 1880 as a Victorian Country House for local merchant, Joseph Gallant. The Barachois Inn is close to Cavendish Beach – the home of “Anne of Green Gables”. Ideal for an elegant wedding with a moderate number of guests. Dalvay By the Sea Heritage Inn and Dining Room – This luxurious 1895 inn, located in Dalvay, which is 30 minutes outside of Rustico, is one of the only seaside resorts in PEI. It hosts weddings during the shoulder season in May and early October. The venue can accommodate up to 100 guests. Caseley’s Wedding and Event Planners – If you are planning a destination wedding in PEI and you need some assistance, this company, located in Kensington, PEI, can help you with the details. Lunenburg, located on the Lighthouse Route in Nova Scotia an hour outside of Halifax, is one of the prettiest towns in Canada. A UNESCO World Heritage Site, Lunenburg has long been the heart of Nova Scotia’s fishing and shipbuilding industry (the Bluenose was built there) and more recently is home to a thriving artistic community. Its charm lies in its beautiful harbour, its exceptional architecture, its museums, quaint shops and galleries. A gorgeous place for East Coast weddings. Incidentally, if you’ve seen the movies Simon Birch or Doloris Claiborne, you’ve seen Lunenburg. They were both filmed there. The Lunenburg Arms Hotel – This 26-room boutique style hotel, which overlooks the harbour, the Atlantic Ocean and the Bluenose Golf course, hosts weddings with up to 125 guests in its convention centre. The Old Fish Factory – Although it doesn’t sound like an appealing place to tie the knot, this restaurant, which is located on Lunenburg’s historic waterfront at the Fisheries Museum of the Atlantic, is a popular spot in Lunenburg to say “I do.” The restaurant, a former fish processing plant, specializes in seafood and can accommodate groups of 25-300 for sit down meals. Arbor View Inn – This country inn, known for its award winning cuisine, is nestled on a wooded estate with quiet garden paths and plenty of privacy. Weddings take place in the dining room of the six-room inn. Great for intimate gatherings. Newfoundland is becoming one of the hottest destinations in Canada, not only for tourism but East Coast weddings. Its capital St. John’s, the oldest city in North America, is located on the steep inland side of St. John’s Harbour. With its colourful buildings, rocky shoreline, and ships docked in the harbour, St. John’s is true eye candy. But it’s more than just a pretty face. It’s filled with fun shops, galleries, museums and restaurants. The Fairmont Newfoundland – This venue, which is a first class hotel and landmark situated in the heart of St.John’s, offers breathtaking views of the harbour, the historic city centre, and Signal Hill. Wedding packages include complimentary accommodation for the bride and groom, champagne, breakfast, and more. The hotel has a professional team of wedding planners that can assist you with your wedding. Leaside Manor – Rated as one of the top Canadian romantic destinations by the Globe and Mail, the Leaside Manor, a Tudor mansion and heritage property located minutes from downtown, is an ideal setting for weddings with less than 60 guests. Numerous wedding packages are available at the inn. The Waterford Manor – The elegant Waterford Manor, a private inn built in 1901, plays hosts to weddings. The Victorian style heritage inn has seven rooms tastefully decorated with 19th Century local antiques. The Inn was featured on the cover of The Canadian Bed & Breakfast Guide (98/99 edition). Live Wire Events – Whether you want an elegant wedding at a hotel or bed and breakfast or a wedding on the rocky shoreline or fishing pier, these wedding planners can make your vision a reality. If you’re a history nut, why not get married at one of Canada’s historical museums or monuments. Signal Hill and Cabot Hill for instance are just a couple of sites that are available for wedding ceremonies.